At the many Orthodox weddings at which we've performed, we create the most impact by kicking off the second round of dancing. The first dance set has the chossen and kallah making their grand entrance followed by a 40 to 45 minute hora. After the entree, the surprise appearance of The Amazing Bottle Dancers hands clasped, making their way across the floor gracefully balancing open bottles of wine atop their hats, without spilling a drop, is a wonderful and surprising way to introduce the second round of dancing, as our program leads right into another incredible hora! Imagine, kicking off the second Hora after the entree�The Amazing Bottle Dancers, hands clasped, dancing across the floor balancing bottles on their hats without spilling a drop. Treat your guests to something truly unique. Get more for your wedding! 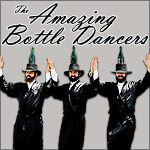 Don't forget to mention ChossonKallah.com when visiting The Amazing Bottle Dancers.